Volatile organic compounds (VOCs) produced by algae and cyanobacteria are primarily responsible for odors in fresh waters. Among other functions, VOCs may serve as important infochemicals in biofilms of benthic primary producers. VOCs liberated by benthic, mat-forming cyanobacteria can be used as habitat-finding cues by insects, nematodes, and possibly other organisms. We developed a new gastropod behavioral assay that allows detection of food preference without offering food, thus allowing the distinction between taste, which requires direct contact with the food source, and the detection of odorous infochemicals, which work over distance. We demonstrated that VOCs released from disintegrated cells of a benthic, mat-forming, green alga (Ulothrix fimbriata) are food-finding cues (“foraging kairomones”) that attract the herbivorous freshwater snail Radix ovata. 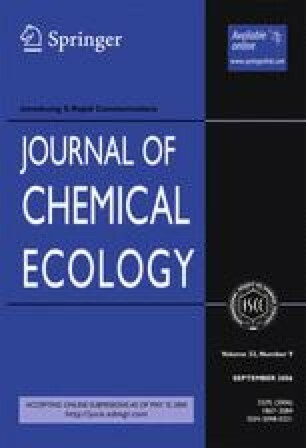 A mixture of three C5 lipoxygenase compounds and 2(E),4(E)-heptadienal that mimic the major VOCs released by U. fimbriata attracted the snails, whereas neither the mixture of C5 compounds nor 2(E),4(E)-heptadienal were effective when given alone. This study suggests that VOCs can play a steering role as infochemicals in freshwater benthic habitats, as has been established for many organismic interactions in terrestrial ecosystems. ITIS 2004. Integrated Taxonomic Information System. http://www.cbif.gc.ca/itis.